A clear, cold night with excellent seeing was the forecast for Monday, 28th November, so I set up in the back yard for an overnight session. 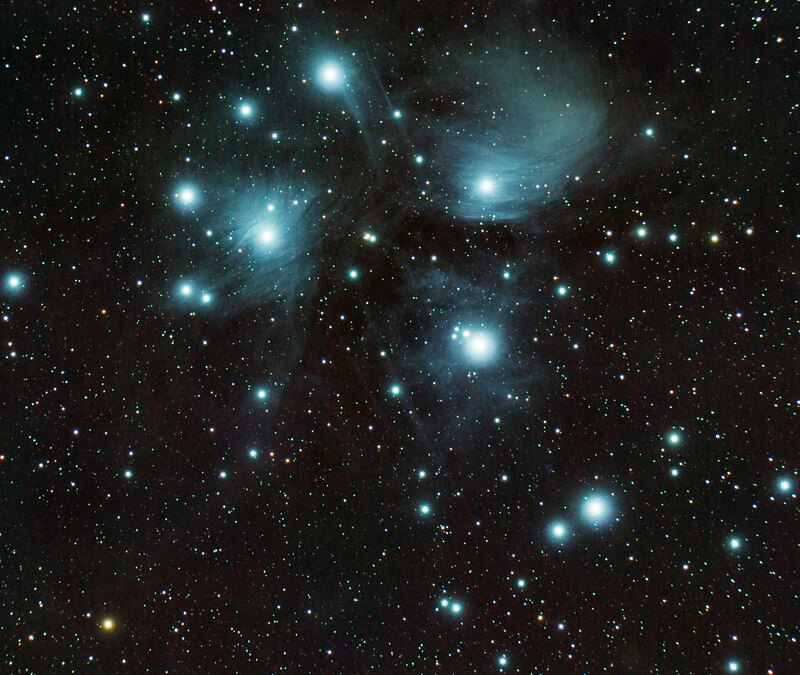 Messier 45 “The Pleiades” would clear the tree line at 21.33 (south-east, elevation 53°) and disappear behind the roof line at 02.29 (south-west, elevation 45°) the following morning. Perfect conditions for leaving the system running on its own. The initial polar alignment of the mount was accurate to 7 arcmin, reducing to 3 arcmin after one iteration of the handset’s feedback routine. Something wasn’t right, as the feedback routine wouldn’t display all the required information to make the proper adjustment, so I had to resort to twiddling the knobs “about the right amount” from an earlier manual calibration session. 3 arcmin of alignment error (with the focal reducer at 636mm focal length) means one pixel of trailing in about 135 seconds, so I set the timer for 90-second exposures with 30-second pauses for the sensor to cool down between frames. 30 frames per hour over 5 hours would net me 150 frames. My alarm clock went off at 2.30, when I switched off the mount, screwed the end cap on the telescope, set the camera timer to take another 65 “dark” frames and went back to bed. The battery-operated dew heater kept the telescope objective above freezing, but the camera was frosted over the next morning. 150 frames take some processing, and the cooling fan on the Mac was up to full speed by the time I’d finished. Some of the nebulosity has been sacrificed in the processing, as there was a most unwelcome flare in the centre of the photo – probably an urban light source? This target never climbs more than 60° above my local horizon: at its highest elevation, it is due south right across town, and something was the right wavelength to get through my IDAS D1 light pollution filter. Still a pleasing result for a session devoted to one of the classic targets. ISO800, 150 x 90 sec. This entry was tagged Altair Planostar 0.79x reducer, Altair Wave 115/805 ED Triplet, AZ EQ-6, M45, Nikon D90, Unguided. Bookmark the permalink.